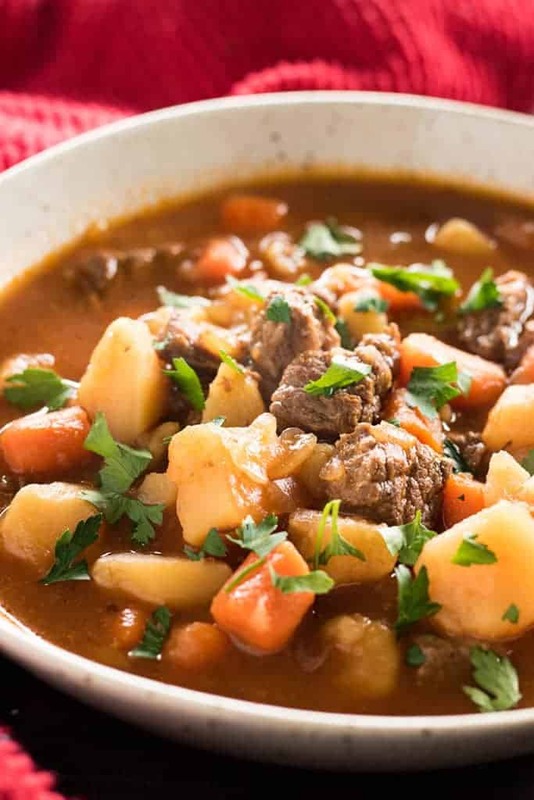 Best Ever Instant Pot Beef Stew – This mouthwatering and easy to make Instant Pot Beef Stew is sure to become one of your favorite ever Instant Pot recipes! Tender beef is simmered in a super flavorful and hearty broth that’s packed with veggies! Well, you guys, it is way past time for me to post another Instant Pot recipe! What better way to kick off comfort food season with a quick and easy beef stew? This tastes so amazing like it’s been simmering away for hours, but it really takes less than an hour and most of the foot work is done by our magical friend, the Instant Pot! The last time we talked Instant Pot here, we talked about how I was liking it, and my first experiences. Well, I LOVE it and I’m completely addicted to the thing! I have a feeling it will be getting regular use year round because it’s almost always the fastest way to get dinner on the table, and it will keep me from having to heat up my oven once that scorching summer heat comes back! If you haven’t seen my first two Instant Pot recipes, you must check them out! Everyone is loving both my Instant Pot Spaghetti and my Instant Pot Country Style ribs! So, this beef stew recipe makes exactly enough to serve four people. Sometimes I can give or take a little on serving size, but this came out just right for four. The good news is, there was plenty of room in my Instant Pot should I have wanted to double this recipe! 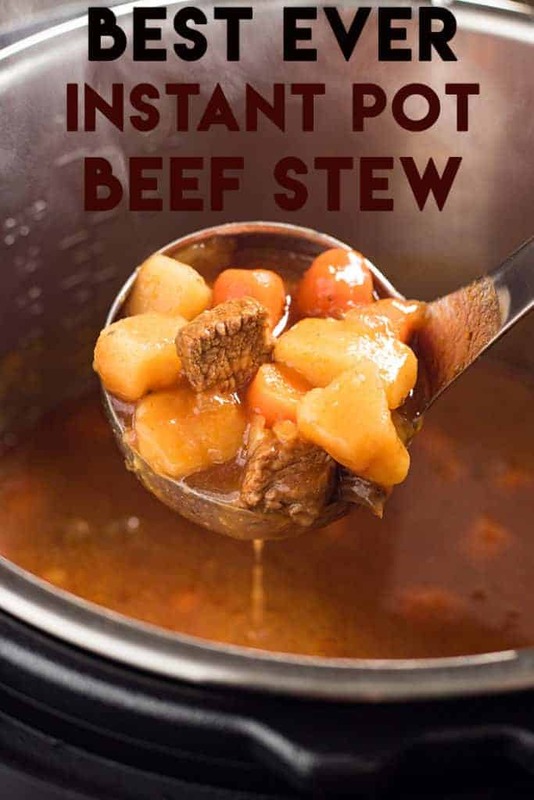 It’s so tasty, and I think everyone likes stew so I’d gladly double this and serve it to company! Another win with stew is that it’s relatively cheap to make. Sear the meat first as directed in the recipe! Taking the quick stepto sear the meat instead of just tossing everything it produces a much more flavorful stew. Natural release for the best results. It’s best to always natural release anyway when you have really hot boiling liquids like this. I also prefer the natural method for the best texture in the meat. Don’t let this cool before adding the cornstarch/water. You want to add the cornstarch and cold water mixture while the stew is still nice and piping hot for the best thickening. If you like your stew extra thick, you can double the cornstarch mixture. 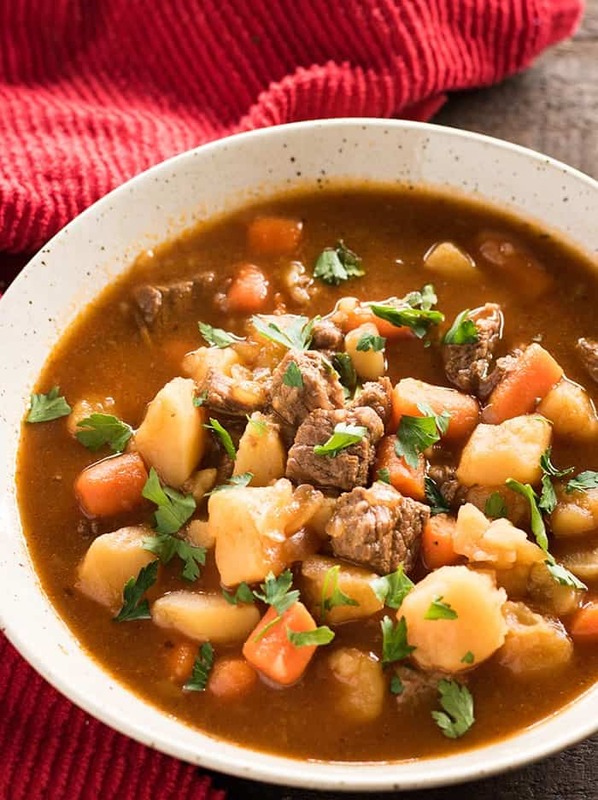 Best Ever Instant Pot Beef Stew - This mouthwatering and easy to make Instant Pot Beef Stew is sure to become one of your favorite ever Instant Pot recipes! Tender beef is simmered in a super flavorful and hearty broth that's packed with veggies! Just made this and it is amazing! Only thing I did different was cut my veggies chunkier since eveeyone said they dissolved. And worked like a charm!! 1. My stew seemed a bit watery so next time I will reduce the amount of beef broth. 2. The vegetables were a bit soft, so I hink reducing the cook time by 5 or 10 minutes would solve this issue. 3. Perhaps a little more garlic would help the taste as well. 4. The picture shows parsley on top, but no parsley was included in the ingredients. Otherwise a very good meal! Loved it. I added veggies other than onion till after meat was cooked and did 5 min low pressure with slow release and they were perfect. Also used pearl onions. My first effort in the IP and Such a success!!!! Thank you for the helpful, specific guidelines!!! Very very good. Definitely worth making and everyone likes it. This is my favorite stew recipe. I add celery, a sweet potato, and reduce the garlic, and sometimes add red wine. My only complaint is that the potatoes disintegrate and that’s a real bummer I’m not sure if reducing the cook time would be okay. Very good taste. I like the tomato beef broth. The meat was very tender but the veggies were overcooked. The potatoes were pretty much dissolved. I think next time I will cook for 25 minutes. I made this tonight but didn’t follow the recipe. I didn’t have beef broth so I used red wine and chicken soup. I used tomato sauce with garlic and onions in it. I also used Kosher meat. It was so delicious. Add about quarter cup of sriracha and it’s perfect for my taste. This recipe is perfect. Made it tonight and it’s our new beef stew recipe. Very easy, packed with flavor, and I had all if the ingredients on hand. I made it as is, other than adding turnip and cherry tomatoes because I needed to use them. Used mini potatoes with skin, but otherwise followed the recipe exactly and it came out great. The meat was tender with lots of flavor, and the veggies came out perfect, too. This is a keeper! Made this tonight for my husband and I turned out great! I substituted stewed tomatoes instead of the tomato sauce and added a can of peas at the end and let it sit about thirty minutes with the warmer on. Have enough leftovers for dinner tomorrow and for me to take to work!!! Yummy, GREAT RECIPE!!! I made this last night and it was UNBELIEVABLE! From the overall delicious flavor to the perfect tenderness of the meat and veggies…this has been added to our family favorites and I already cannot wait to make it again!